If you live along the east coast, chances are good you’ve seen this one. In any case, grab your virtual flip-flops while I gab about my favorite place to vacation, North Carolina’s barrier islands. The Outer Banks. For our fiftieth birthday year, my friends and I, aka “the girls,” celebrated each of our big days with a special event. We went so far as to do a full murder mystery weekend with incriminating phone calls, scripts, secret notes and costumes. I’m a writer. Why not? We mulled over a special way to end our big FIVE OH with a 'sit back, relax and enjoy the blessings of our life long friendship' vacation. After a lot of research we picked the, till then unvisited, Outer Banks. It was a longer drive than we’d wanted but the off season rental rates were far too good to pass up. We deserved an oceanfront house and oh yes we found one. 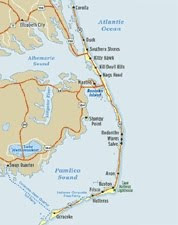 The Outer Banks is a long strip of narrow sand bars protecting the North Carolina mainland. Its history is as rich as its colors are beautiful: Let’s start with Sir Walter Raleigh’s English settlement in the1580s, now known as the Lost Colony of Roanoke. Add Blackbeard's pirate base on Ocracoke. By the 1800s, the area became known as the Graveyard of the Atlantic due to numerous shipwrecks. 1903 brought the Wright Brothers to Kill Devil Hills. Their mailing address, Kitty Hawk, became synonymous with their famous first flight. During the Depression, CCC and WPA workmen constructed high dunes and planted sea grasses to reduce erosion and stabilize the shifting land. Today, a good portion of land is held as national seashore or protected nature preserve, thus keeping the pristine beauty of this dune habitat protected from even more construction. I'm an off-season sort of girl, and October is a wonderful month to visit, still summer to us northerners, and the ocean is warm, the beaches almost empty and traffic light. Family and friends alike take turns making meals and everyone is free to venture out to lighthouses (there's four), museums, galleries and great shopping. There’s always sunrise on the ocean, sunsets on the sound, wild horses, nature reserves, history, and great restaurants. Plenty to do or listen to the ocean lull you to sleep. There is nothing so peaceful to me than watching the waves, catching sight of dolphins and finding another beautiful seashell. Beachcombing at its best. I am drawn to the constancy of the ocean. I’m reminded how small I am and how big God is, and that's very comforting. Sometimes I think I hear God better when I’m outside and there’s no roof over my head. We've had some pretty good chats along those breaking waves. Do you have a place like that? Somewhere that makes you feel just a little bit closer to Him than anywhere else? Maybe you're not sure He can hear you. It's hard to believe He wants our company--so much so that He's done all the work and is just waiting on you. Check this out from the group Audio Adrenaline: Ocean Floor. I carry a little bit of this place with me when I go home. Sure, sand in my shoes and shells in my pocket but also the joy of the quiet times of renewal. For me, it will always be my “happy place”. Do you love the ocean like I do? If you've visited the Outer Banks, tell me what you love about it. Or entice me to try another place! If you’ve seen the movie Nights in Rodanthe, you’ve seen a bit of the Outer Banks. Rodanthe is a village along the National Seashore of Hatteras Island. My family and I were just down the road during the filming of the movie and later, "the girls" saw the movie at the Kill Devil Hills theater during its premiere week. Oh, by the way FLX is Finger Lakes, NY. That’s for another day. If you'd like, leave a comment with your e-mail address included (include spaces or brackets around the "@" sign so Net spiders, etc, can't phish your address) to be in the drawing for today’s giveaway "199 Promises of God" by Bethany House Publishers and our big Grand Opening giveaway. I saw the list and there's some really great stuff on there! EEEEEEE I LOVE the Outer Banks! I just went there on my first "real vacation this year! I climbed the Hatteras light and almost died on the way down...I didn't realize I was afraid of heights til I got to the top...then I was afraid to come back down! Here's a few of the pics I took! Great post, the colder weather has had me wishing for the beach! Good morning, Deb, I really liked your post. I'm not familiar with the Outer Banks although I've heard of the Graveyard of the Atlantic. I thought it was farther south but it makes sense when I look at the map. BTW - thank you for the map. Although I have't seen the Atlantic, I've overlooked peaceful Nova Scotia's Bay of Fundy at high tide but I couldn't really appreciate it's beauty 'cause I'd just charged out of the boot camp gas hut and had tears streaming down my face, my skin felt like it was on fire and I felt like puking. Hmmm. Someday I'll go back and give the scenery my full undivided attention, eh. I've camped at Pacific Rim National Park just metres from the shore. In fact, high tide was so close we almost moved in the middle of the night until we realized what it was and no one else seemed worried. The next morning we walked for miles along the Pacific shore picking up shells and sand dollars while keeping an eye out for Japanese green glass fishing floats. I remember the village of Tofino nearby where everyone's driveway was made from crushed oyster shells. Neat and different. And I've stood on the windy shore of Lake Superior and thought of all the ships buried in that frigid water where its so cold everything stays the same but it's also too cold to dive and explore. Thanks for letting me re-live these memories. I'm glad to find another OBXr. I'm going to go off site next and look at your photos. I admit I get a little smile on my face each time I see someone with the OBX sticker because I hope they found it as beautiful as I did. The first time we went, I heard the ocean's rhythmic boom, got through the house to the deck and saw the breaking waves--then proceeded to cry. Something about it touched me. Love at first sight? Thanks for leaving a comment and sharing my happy place. You've been places that I've only dreamed of. Like Canada (KIDDING!) But we do share that Bay of Fundy Experience. What a sight to see the fishing boats just sitting on the bottom of the bay, knowing that in the next 6 hours the water would rise with the incoming tide and raise them 20 feet or more. And I can't help but mention the scallops in Digby. Fresh off the boat and the biggest I've ever seen. Nova Scotia was beautiful (and the people talk even funnier than you do. KIDDING). Nova Scotia has both a Scottish and a French history. For my history lessen today, the area was call Arcadia. When a large number of these people, the Arcadians moved to the bayous of the gulf coast they became known as the 'cajuns'. I used to live on Lake Ontario but I agree there is something more compelling, maybe frightening about Superior. Thanks for sharing. I hope you QC'd me by the way! Happy belated Birthday! Soudns like you had a great day. I don't know anything about the outer banks and have never been up to the northeaster states, but shipwrecks sound like some great plot starters! Debra, those beach pics are making me long for a vacation. Beautiful! Jessica dear, that 50 vacation was three years ago. In fact I spent "the big one" in the outer banks. Thanks for being surprised, though! I do have a plot in mind for a historical set on the OBX. I see that you're zipping through your current WIP. I admire your diligence. thanks for stopping in. Hey Eileen. You and me both. I'm longing for a getaway and wish it wasn't such a long drive to NC. When my sister lived in Virginia, she was going to take me there but it didn't happen. Then, when my son left boot camp, we were going to spend a few days there before taking him to Fort Bragg. Unfortunately, the very mean drill seargant gave everyone only 24 hours to report to Fort Bragg. Since we were in SC instead of NC, we had to settle for Charleston. But hey, have you ever been to Charleston? It is absolutely adorable. I still want to get to the OBX, though. Oh, and btw, my son was living near FLX when he joined the army. Renee, thank you for sharing your website and pictures with us! Oh, Deb, I almost forgot...re your Scottish and French history lesson. The Scottish portion of my family went from Scotland to Nova Scotia to Maine (late 1700s) to Missouri, and then to Washington. The French portion of my family went from France to Scotland to England to Connecticut (early 1600s) to Washington. Hi. I am from the Nags Head area. As children and young adults we went down often, but now that I am all grown upand moved away, we go to Altantic Beach,NC we have a small place down there. It is also a beautiful place with lots of history. Morehead City, NC has an annual Seaford festivial the 1st weekend in October. Its great. I live about a two hour drive from the Outer Banks. We bought our second dog in that area, and took both of our little malti-poos to play in the dunes on the trip home. Bella, the new puppy, was just a little puff of tan and white fur who fit in your palm. She was so cute trying to run up the sandy mountains. Whenever life is really rough, I head for the beach and take a long walk. Like when I get a rejection letter I wasn't expecting. I like to imagine meeting with God on a mountainside cliff or on a beach when I pray. I've never been to the Outer Banks, but you make me want to go. I picture it similar to Anne's Avonlea. A place I've always wanted to visit. Oh, I've never been there, Deb. It looks wonderful. I grew up near the beach and there's still seawater in my veins. I miss being close to the ocean. Ok, I do not miss the seagulls' -- well, you know. Anyhoo, lovely post, Deb. Hey Suzie Jo. Yes I've been to Charleston. Just long enough to walk around the water front. Thanks to the GWTW sequel "Scarlett" I imagined Rhett and Scarlett there. I purchased a print of the beautiful Victorian houses along the water standing up to to a terrific storm, so I have a constant reminder of the area. Dina, if I had a two hour drive I'd be making plenty of trips to get to that beach! Any good walk will help but the best is along the shore, for sure. Lisa, I think of NE and the provinces as very rocky shore, but I'd love to visit the upper St. Lawrence, myself. I know that way way up there, the beluga whales come up river at some point in the year. That must be some sight! April, I will look into that festival 'for future reference'. I know I should try another place for vacation but some places I just want to keep going back to. (OBX, Savannah for instance). Thanks for the suggestions. And Thanks for leaving a comment. Well, I must get back to work, my mini mental health vacation has ended too soon. Deb, so I'm sitting here reading the posts and the one where you say you're 3 vacations past the big 50 floored me. That's my age! And gee whiz, lady, you certainly didn't look it in Denver. Good for you! Would love to sit by the ocean and just listen and pick up sheals but can no longer walk that well, so just sitting will have to be all I can do. But I am here and about 4 hours from the SC beaches for I guess I will just stay home and look at other's pictures. Edna, I'm sorry to hear that you feel you're past the beach combing days. I have some of my shells in jars and I can't tell you the enjoyment I get just going through them and sorting them because the same emotion comes back. I hope you can do that too. Susan - how funny. It's hard to creep up on bumperstickers on the interstate to get close enough to read them, isn't it? Anita Mae - my oldest is 33 so I have to try to keep at least 20 yrs ahead of him, but you go on and think what you will. Bless your rock-hounding lil heart. What a beautiful place. My prayer partner lives in Charlotte, NC and I am looking for another reason to go out and visit. I wonder how close that is to the Outer Banks. This made me long for another vacation. Hey, Deb: A beautiful and informative post. I've tucked the Outer Banks into my bucket list. I remember when we moved from San Francisco. The beach there was where I took my dogs and sorted out my thoughts. I grieved for the sands and rolling waves for quite a while. And though they're out of sight now, they're never out of my skin. Oh, how I love the smell of the salt air. Tamika, I hope you come back and take a look 'cause, (being a former travel agent) I looked it up. Seems to be about 6.5 hrs from Charlotte to the OBX. North Carolina is a big state and you'd be going west to east. I sure hope you get a chance to visit it. Thanks for stopping by. I see you're a follower of our blog so I appreciate that and for speaking up with a comment! Connie, nice to see your smiling face again. We missed you. I admit that one of my 'writing' soundtracks is a CD called Carmel by the Sea. Lots of wave action, seagulls, you know. But it's convincing enough because I swear I can smell the salt air too, and feel the breeze on my face. Take me away, Calgon Bath Oil Beads, to the OBX. I will say that I expect a special delivery invite to the 51st birthday celebration. I will even bring a trunk of novels, chocolates, and a cooler full of organic food. Oh-h-h-h-h-h---how beautiful! Is that a real Chincoteague pony?! The word wallow doesn't seem to be a very pretty word--but that's what I'd love to do in a place like that! Walk along the beach, sit on the beach--and make sand angels on the beach :) A nice take-me-away moment--Thanks Deb!